Phil Hunt, coordinator of FPMT probationary project Enlightenment for the Dear Animals, shares about his visit in early 2018 to FPMT project MAITRI Charitable Trust in Bodhgaya, India. Heading out at dawn through the outskirts of Bodhgaya on one of MAITRI Charitable Trust’s regular Mother & Child mobile clinics, I could quietly witness the pollution and poverty all too apparent at the edges of towns and the main roads. It’s not the romantic image one would like to have of the place where the Buddha walked and taught all those years ago. Bodhgaya is in Bihar, and Bihar has one of the highest incidences of leprosy, TB, and infant mortality, and one of the lowest literacy rates in India. 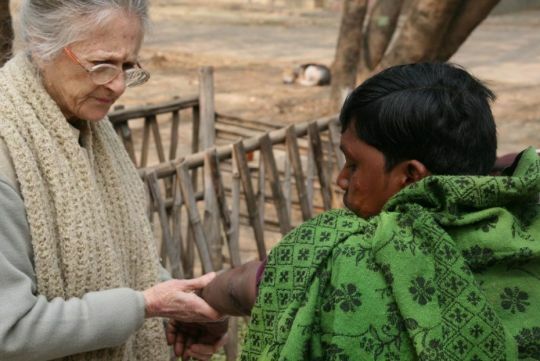 Adriana Ferranti reviewing a new leprosy case, MAITRI Charitable Trust, Bihar, India, January 2018. Photo by Phil Hunt. The work that MAITRI does is not romantic either. Identifying people with leprosy, cleaning and dressing ulcers in flesh damaged due to localized deadening of the nerves, identifying people with tuberculosis (TB), collecting and analyzing sputum samples, assisting undernourished TB patients, or prenatal mothers, or newborn babies, and treating injured, maimed, and sick animals that have nowhere else to go. 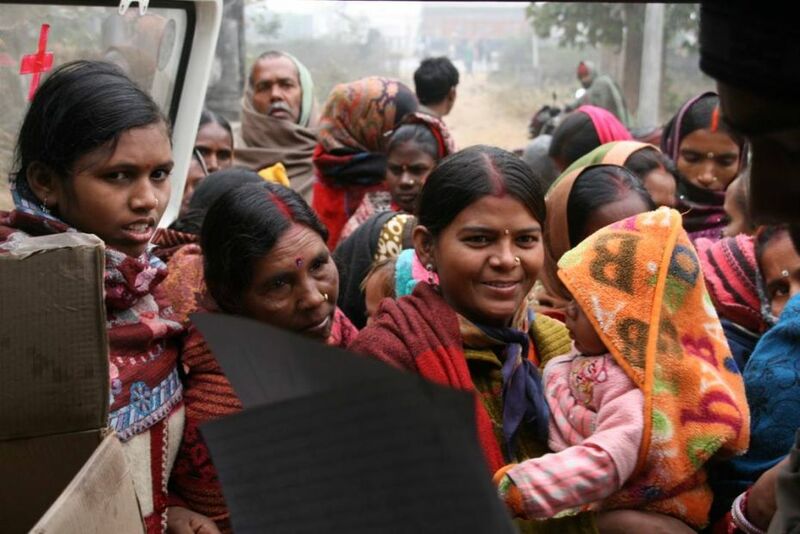 On a foggy winter morning where the sun didn’t show up at all, the mobile clinic team headed away from the hubbub around Bodhgaya where His Holiness the Dalai Lama had arrived. Down the highway towards the Delhi-Kolkata Trunk Road. Past poverty and the grime you get when construction has arrived, incomplete, but with few of the benefits. The intersection with the Trunk Road is rubbish-filled, noisy, scattered with long-distance trucks and generally ugly. MAITRI staff member testing a patient’s sputum sample for tuberculosis, MAITRI Charitable Trust, Bihar, India, January 2018. Photo by Phil Hunt. His Holiness had come to teach on the Four Noble Truths. And we all know the first one is the Truth of Suffering. Here it is impossible to miss. His Holiness’ teachings were particularly responding to an Indian request, and he highlighted again and again how it is the Indian tradition that the Tibetans inherited and preserved, and that is now returning to its homeland. One of those traditions is cherishing others, based on critical analysis of its benefits. Looking around Bodhgaya and surrounding districts at the poverty and ignorance, how could you possibly think you could make any impact? Yet these are the sentient beings Buddhists have pledged to bring to enlightenment, that Christians go to serve following the example of Jesus, that the left side of politics works to uplift, that the right side of politics promises to benefit through a ‘trickle down’ economy. They are the global neighbors with whom we have responsibility to share the riches of the world fairly. Indeed, these are the beings that might have been our direct neighbors if our karma had been very slightly different. 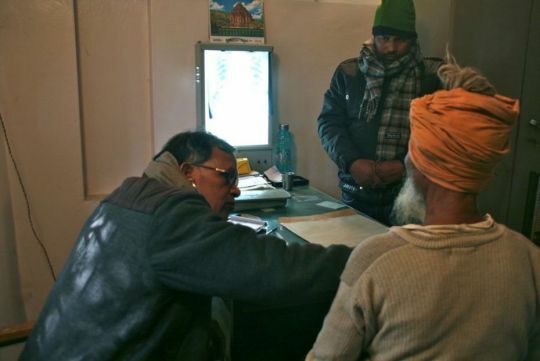 MAITRI staff reviewing an x-ray with the patient, MAITRI Charitable Trust, Bihar, India, January 2018. Photo by Phil Hunt. Is trying to help simply a futile gesture? Some token feel-good exercise? It is easy to think this way. Yet we all know of how special it was to receive help when we needed it. Not a thousand other people, not five desperately needy, not a stranger over there. Us. You. Me. When someone had stopped to help us when we thought nobody would. That individual out of so many who happens to be feeling, thinking, wishing to be free of this particular suffering. To be helped, how wonderful! What relief! Perhaps this is what pushes MAITRI staff to work so hard, understanding that some of these individuals can be helped and MAITRI can do it. 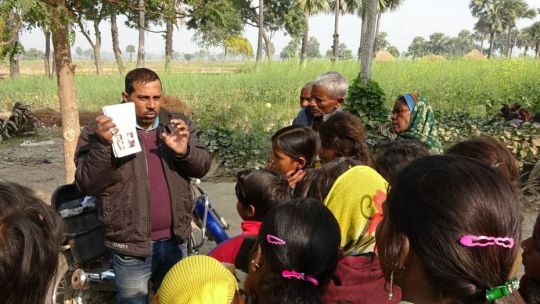 MAITRI staff conducting leprosy training in a village, Bihar, India, January 2018. Photo by Phil Hunt. The 16 Guidelines for Life also come to mind when I see MAITRI workers in action. Humility—the founding and ongoing recognition that only the government can possibly reach every citizen, therefore a charity that works in partnership with the government will be more effective to render assistance to those who fall through the cracks. MAITRI is the only organization authorized by the Government of Bihar to assist the District Leprosy Office in Gaya District. Patience—not just with everything that Bihar throws at you, but also with those patients who are slow to understand the role they must play in their own healing. 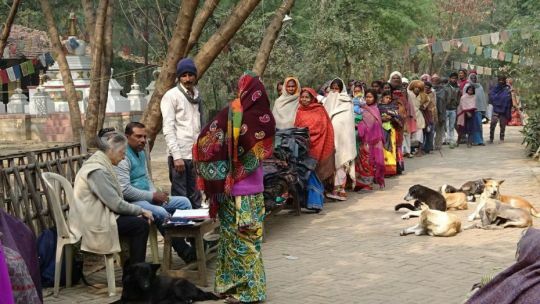 MAITRI staff distributing blankets to the poor, MAITRI Charitable Trust, Bihar, India, January 2018. Photo by Phil Hunt. Contentment—perhaps it is more of an acceptance, but everyone’s ability to put up with the poorer equipment, the less than comfortable surroundings, the outbursts of barking from the rescued dogs, the overwhelming numbers of patients when it is supposed to be a regular clinic day. Kindness—it is written through everything. The staff and in-patients mix regularly in formal situations (at check ups, dispensing medicines, ulcer dressing) as well as around the campus. Those hospitalized can spend weeks or months here slowly gaining the strength to return home and thus become part of the MAITRI family. Pre- and post-natal mothers who come for checks can be regular visitors over many years with different births. 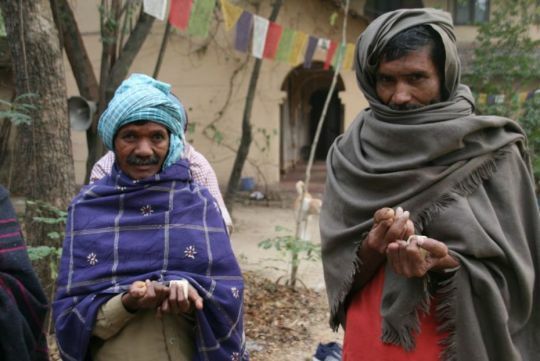 MAITRI staff distributing tuberculosis medicine, MAITRI Charitable Trust, Bihar, India, January 2018. Photo by Phil Hunt. Generosity—MAITRI not only gives outright (medicines, blankets, supplements for TB patients, sandals for leprosy patients, medical costs for reconstructive surgery, and so on) but also through encouraging reciprocal giving. The Village Schools program was set up to encourage the local community to invest in the education of its children by committing to building and maintaining the school buildings and ensuring boys AND girls attended. Those coming from a long way to receive help are given half their travel costs. Respect—for those who are the lowest of the low. For those with leprosy, a disease that still attracts social stigma, or mothers with a newborn girl where the father is afraid of another dowry. For a wife with TB whose husband hadn’t given her permission to see a doctor. 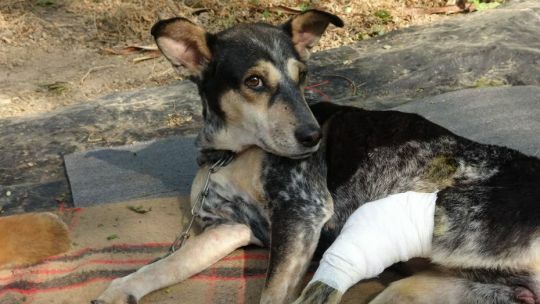 For a dog paralyzed in an accident who would not be looked after anywhere else. MAITRI leprosy patients enjoying sweets during the MAITRI new year celebration, MAITRI Charitable Trust, Bihar, India, January 2018. Photo by Phil Hunt. Loyalty and total commitment to those individuals that need help and who need it now. Many times I have seen staff work well past lunch, dinner, or knock off time to assist a person or animal needing help. They are also very loyal to their communities and the networks MAITRI has developed over the years. It is these networks that are vital in the TB drug distribution process. They also help in identifying potential cases, people who might otherwise miss out on treatment altogether. MAITRI’s Director, Adriana Ferranti, had a series of clear goals at the beginning. Most of them have already been achieved, such as the campus buildings and the afforestation of the land. The Aspiration to complete the tasks and do more is always there, even though the money is always tight. “In the Service of others” was and is MAITRI’s modus operandi. One cannot forget these two guidelines: Perseverance and Courage. No examples are required. Belen the dog wearing a fresh bandage at MAITRI Charitable Trust, Bihar, India, January 2018. Photo by Phil Hunt. Whenever I try to summarise what MAITRI does, it is invariably long-winded and somehow insufficient. How does it manage to help those who really don’t have the karma to be helped? Like that day when a new referral was found to be positive for TB. Imagine being that person who is now embraced by an organization that would move mountains to ensure you get the medical help that you need. So many don’t get noticed, don’t get checked, and don’t get helped through the long process to health. Not many people have the karma to save someone’s life. MAITRI does this week in week out, and has done so for nearly thirty years. Meanwhile Kyabje Thubten Zopa Rinpoche’s voice chants mantras and sutras over the loudspeaker system heard by all. 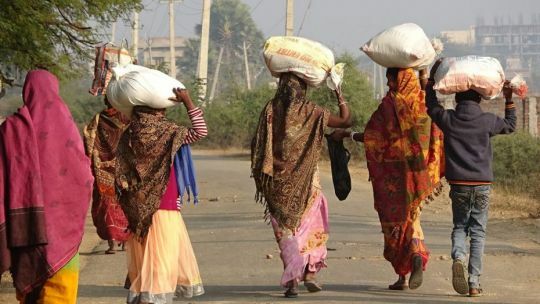 People carrying donated supplies home from MAITRI Charitable Trust, Bihar, India, January 2018. Photo by Phil Hunt. Looking at MAITRI like this makes it sound like everything and everyone is working perfectly. This is samsara, and this is Bihar. The individuals being helped are very low in society’s pecking order. There is corruption throughout society, there is neglect and indifference. Services are poor, the climate is harsh, the environment suffers from the weight of humanity. MAITRI itself is hobbled by court cases fighting to recoup losses from some of these social ills. Its buildings need repair, there isn’t enough staff, and those who are here are prone to the usual failings. There is never enough time or money. There are always more sick, ill, or vulnerable. It is an impossible job. Yet here MAITRI still remains, in the service of others with compassion and care. Feature image: MAITRI paramedical staff member Arun disbursing supplements to pre and post-natal mothers during a Child Mobile Clinic, south of Bodhgaya, India, January 2018. Photo by Phil Hunt.